Interested in museum documentation? Having trouble sleeping? Then read on. I mentioned the Arts Council England Accreditation Scheme and the SPECTRUM documentation standard last time as key sources for information and guidance on documenting collections. When it comes to museum labels, SPECTRUM actually has a quite specific guidance on labelling and marking museum objects as it is such an important aspect of museum work. Put very broadly, the guidance recommends marking or labelling items or groups of items in a way that is permanent without damaging the item. Labelling and marking should be secure, reversible, safe for the object, discreet but visible and convenient and safe for staff and volunteers. This is the modern standard but of course, sadly this guidance wasn’t in place in the past so we have to deal with problems associated with historic labelling of specimens all the time when working with older collections with labels that weren’t securely attached, permanently emblazoned in indelible ink, damaging to objects, impossible to read and inconvenient for staff and volunteers. Figure 1 shows a typical older natural history label, in this case a label for a specimen preserved in fluid, recording what was considered the key information about a specimen that you would need to see when you had the specimen in hand. Further information (ideally) is linked to the specimen through the accession number as mentioned last time. They key fields of information on natural history labels is a scientific name, a locality, the accession number, the source information and a date. However, there are problems with each of these fields of information on natural history specimen (and other kinds of museum object) labels which need to be kept in mind when extracting information from them. This is where the detective work of collections management begins but I’m keen to stress that a lot of this deduction normally happens mentally. As we’re taking the time here to go through step by step I’ve written all of this out but with staff who are subject specialists all of this information is kept in mind when managing collections information. Scientific Name As I mentioned last time, this can be very problematic as we need to unpick what the name means, what was the consensus at the time it was written and who was writing the label. Although there is a very robust system that regulates biological nomenclature names change all the time as biologists name new species, split older species or correct previous errors where multiple names were used to refer to the same thing. We have to consider all of this when interpreting museum labels. For example this specimen is labelled as ?Octopus sp. meaning that whoever labelled it wasn’t sure if it was a species of Octopus or not (to throw further confusion into the mix, octopus is both a common name and a genus name so there are some octopuses which are not Octopus). Depending on when it was documented the understanding of what an Octopus might be may have been very different. Today ‘octopus’ could be used to refer to any one of 300 known species, in the past this would have been less. It may also be that the name that was used at the time was an incorrect junior synonym, a newer name for a species that had already been described OR it is still a valid name but has been split into one of more species. 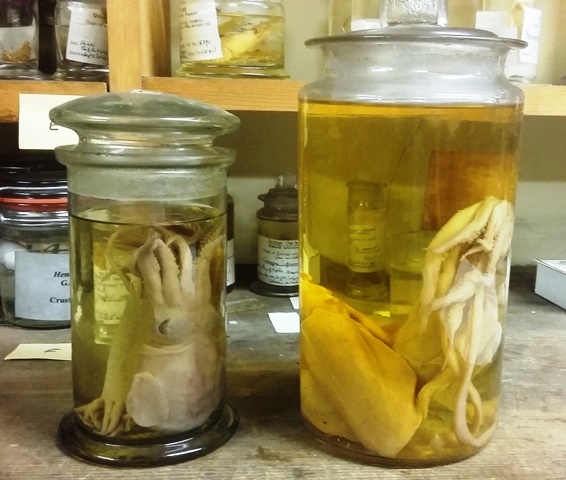 An example from this project are squid specimens which are labelled Loligo media. Cross referencing with taxonomic references, in this case the World Register of Marine Species we can see that this name is no longer valid, it is a synonym of Alloteuthis subulata. However, rather than just update the name, a bit more digging shows that Alloteuthis media is also a valid name so we need to decide by referring back to the specimen as to whether this is A.subulata or A.media or if it is neither of these as the person who identified it may have been guessing, using a limited identification guide or made a mistake. This is fine when a specimen can be identified but sometimes the nature of the preservation may not be diagnostic (for example the specimen has been dissected or is only an isolated arm or piece of skin) so we can’t just discard the label information without considering all of this. Confused yet? I hope so because it’s precisely this kind of detective work that means we can’t just ‘crowd source’ some of the particulars of museum documentation nor should it all be done from the documentation alone without constantly returning to the specimen. The accession number The gold standard field and key to indexing information! With labels in this format, the accession number is fairly prominent and unambiguous. In theory I should be able to cross reference this number with our accession register to find out more about this specimen. Depending on the age of the entry this information may be more or less comprehensive. In this instance, (huzzah!) there is an entry for 13147 in the registers. It doesn’t actually provide us with much more information except this specimen was accessioned into the collection on the 19th of October 1976 and this specimen was separated from a, presumably, large jar of seven specimens in October 1976 and the identifications were’provisional’ and tentative by one J.Hull. Already we’ve got some secondary information which may come in useful later. In this instance the specimen has a modern label and the accession number is clear. In many others in this series, as we’ll see in the next part, it can be difficult working out which, if any, is the actual accession number amongst a myriad of other numbers and labels associated with specimens. Source Information The information given here can be a real mix and again, deerstalkers are needed to understand it. For some specimens, as in this instance, it records a source which isn’t the primary one. This specimen was transferred internally at Oxford University from Reverend Frederick William Hope‘s collections to the zoological collections in 1962. Hope was an extremely important character in the history of the museum and the history of zoology so this association already inches up the potential ‘value’ of this specimen. Unpicking this further, this was an internal transfer and as Hope had been dead for 100 years wasn’t presented to the ‘zoological collections’ by himself. This indicates that there may be an older index to Hope’s original donation to the museum and if we’re very lucky details of the internal transfer from the Hope entomological collections to the zoological collections. This label also refers to the department of zoology and comparative anatomy, a department that no longer exists. Caution again needs to be taken as we need to know a bit about the structure of the museum and the university in 1962 to understand what exactly this transfer meant. Today the zoology collections and entomology collections are in the Life Department. In the past these were a number of different arrangements. For other specimens the source field on a label lists original collectors, dealers, other intermediaries and donors. Again, ideally we’d record the entire ownership history of a specimen from source locality to the museum and sometimes this can be dozens of owners all of which may be important to unlocking the history of our specimens. Date Extremely problematic when this is not authority controlled (more on this later). From bitter museum documentation experience, expressed as a lone date, this can refer to; the date this specimen was originally collected; the date it was donated; the date it was given a number; the date it was formally accepted into the collection; the date it was purchased and pretty much any date you could think of that might be associated with this specimen. Wisely, it’s been kept blank here, presumably because the author of this label hadn’t found a meaningful date that could be ascribed to this specimen. PET PEEVE TIME Today, we mark specimens with a full date with the day, month and full year. In the past this wasn’t a consistent standard and it really isn’t obvious sometimes, as Figure 2 shows, if something is from 1760, 1860 or 1960 especially when specimens were routinely transferred into different jars (as is the case with our specimen figured above). Secondary Information This label records additional information which may come in useful. We can see in Figure 1 that someone has written the higher classification on the specimen, this could sometimes help work out when somebody was labelling the specimen if the terms are outdated or in a different arrangement to modern taxonomy. The label also repeats the information from the accession register that this specimen was previously in a jar with six other specimens so information from those may pertain to this specimen too. We know from cross referencing this number with the accession register that this label was likely written in 1976 so we know that this label style was in use in that year. Alone this information isn’t too useful but when we record other specimens labelled in this style ‘label style’ can act as a proxy to help date specimens without other temporal information. We know that this is not the specimen’s original jar so jar style isn’t necessarily informative in deducing further information about this specimen. Authority Controlled Terms Hopefully, as you’ve seen from this little example, interpreting older information with collections requires a bit of detective work but this is why modern collections management standards exist. Today we have guidelines, standards and practices in place to try to ensure that we don’t create these same problems for future users and managers of collections. Sometimes curators are unfairly maligned as being obsessed with paperwork and procedures but it’s only because we know how frustrating it can be when primary information about specimens isn’t readily available because ‘date’ is so ambiguous or because key information has been lost through sloppy practice. In modern collections management systems, wherever possible we have authority controlled terms- essentially drop down lists of thesaurus terms that you have to pick when documenting specimens. So in combination with our robust fields of information, authority controlled terms and guidance on how to fill out fields we get around subjective and ambiguous information. In this, already too long, instalment we’ve dissected the anatomy of a standard museum label but only 70% of the fluid preserved specimens have one of these ‘modern’ labels. 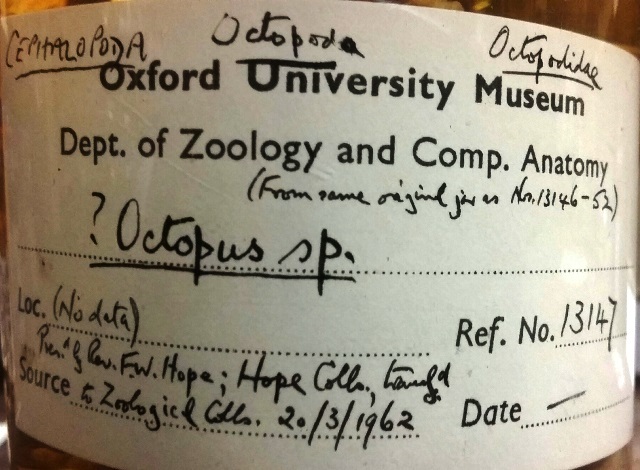 In the next thrilling blog post we’ll look at the range of labels and marks associated with specimens and begin to build up some characteristics of the museum documentation relating to the OUMNH’s cephalopod collections. This process is very much a means to an end and as I said above I’ve laboriously written out a lot of the mental processes that go on in a collections manager’s head. What we’re actually interested in, the use and history of these specimens, is much better informed when we put all this information together and can actually start talking about the amazing animals themselves! Love it! Far from being dry, in my opinion, it’s juicy and fascinating. Gives a good feel of the monumental task facing museum curators like you. Much looking forward to the next instalments.